The Teachings of Silvanus was discovered among Nag Hammadi Library. The texts contain 2 descent myths that build upon previous concepts established earlier. The Teachings of Silvanus (Sil) (CG VII,4) was unknown before the discovery of the Nag Hammadi Library. It is one of the only texts found in the NHL that is not primarily gnostic in origin, and may even contain some anti-gnostic polemic. The work is found in a Coptic translation, though it was originally written in Greek, and the papyrus is dated to 348 CE. Scholars date the composition of Sil anywhere from the second century to the second or third decade of the fourth century. he delivers those who suffer in the Underworld. However, each account emphasizes a different theme. In the first account (A) emphasis is on Christ’s ‘ransom’ of captives ‘from sin’ and the ‘saving’ of them. There is also emphasis on the travails of those suffering in the Underworld. The second account (B) focuses on Christ’s overpowering the Underworld by breaking the chains which bind him and his humiliating the arrogant. Some scholars see the Descent not in terms of an actual Descent into the Underworld, but in terms of Christ’s Incarnation to the present world, which is referred to as Hades. Those who were in travail could be interpreted as those who were “dead in their ignorance with respect to God” not as those who were physically dead. Therefore, the view presented is a gnosticizing tendency in which Christ’s Incarnation descended to this present world, which has become ‘deceitful'(97:30), to battle its “world-rulers of darkness” and evil “powers” (117:13-19) but also to free its captives. 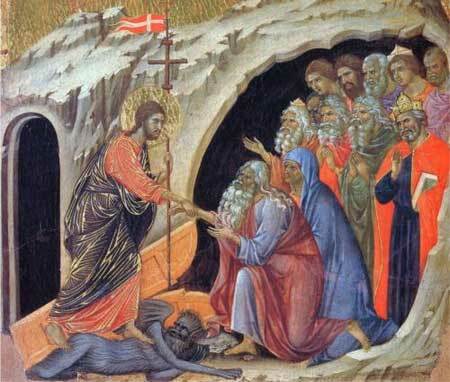 However, this view of the Descent as Christ’s Incarnation is quite different from later traditions of Gnostic Descents. The main reason not to consider Sil Gnostic is because it presents the Creator as the Good Father of Jesus Christ. By the time the Teachings of Silvanus was written, the association between baptism and Christ’s ascent/descent from the New Testament and the Odes of Solomon is no longer present. Instead, it focuses on Christ storming the gates of Hades, and humbling the haughty powers, which may apply to Christ’s taking on many likenesses (103:32-33) e.g. Christ disguised himself so the Adversary wouldn’t recognize Him, and He would have the opportunity to surprise and overthrow him (cf. 96:21-25). Sil also shows a more developed tradition when it refers to Christ’s descent as ransom for sin, thus referencing terminology found in several of the NT books.